Soon, Infinito users can start trading cryptocurrencies on Binance DEX, Binance&apos;s native decentralized exchange, via the Universal Wallet&apos;s built-in DAPP Browser, App Square. The Infinito team is excited about this remarkable milestone and promises to deliver more value to users worldwide. 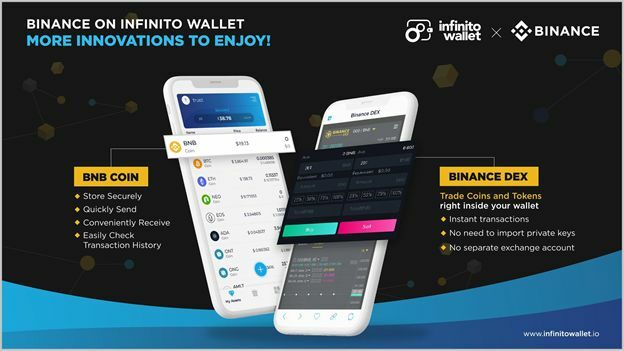 For BNB Coin, Binance is supporting the Infinito team by being the service provider for Binance Chain&apos;s fullnode infrastructure on Infinito Wallet. This technical assistance not only allows the Universal Wallet&apos;s users to be amongst the very first to explore this blockchain&apos;s innovative applications but also enhances the security and performance when using this cryptocurrency on Infinito Wallet. As with any MainNet launch, holders of the ERC20 token, BNB, must perform token swap to transform their BNB tokens into BNB coin on the new Binance Chain. Infinito Wallet will allow you to easily Transact and Check Transaction History of BNB Coin instantly and securely. The Infinito team is excited to bring users worldwide Binance&apos;s valuable service through the world&apos;s most scalable Universal Wallet. According to their roadmap, after Binance, support for more cryptocurrencies and blockchain applications will be added to serve all your daily crypo needs. For now, let&apos;s stay tuned for the official announcement from the Infinito team and get ready to explore BNB Coin and Binance DEX on this Universal Wallet! Become Infinito Wallet&apos;s partners or get your DApp listed on App Square now! Infinito Wallet is looking forward to expand their partner network and DApp list for a greater future. Contact the team behind the Universal Wallet via info@infinitowallet.io. Infinito Wallet&apos;s core development team of blockchain R&D experts has intensive professional experience. Currently, their organization has more than 300 members including developers, designers, business, marketing, and customer service specialists. They are promoting research on infrastructure for cryptocurrencies and development utilizing blockchain.